The Ivy League is an athletic conference comprising eight private institutions of higher education located in the Northeastern United States. Athletic competition continues among the schools, and although no longer dominant, they remain competitive on the national level in many sports. The term "Ivy League" is now most commonly used to refer to those eight schools as academic institutions. These universities were foundational in the development of education in the United States, seven of them predating the American Revolution. They also provided the teachers and administrators for many of the institutions of higher education founded subsequently. Thus, the education of significant early Americans can be traced predominantly to these schools. Today, the Ivy League has connotations of academic excellence, selectivity in admissions, and a reputation for social elitism. All of the Ivy institutions place near the top in the U.S. News & World Report college and university rankings and rank within the top one percent of the world's academic institutions in terms of financial endowment. For many, the best education is synonymous with an Ivy League education. However, in the rapidly developing world of the twenty-first century, the Ivy League schools are challenged to retain such a reputation. This challenge goes to the very heart of the purpose of education, an understanding that may need to be adjusted to support the needs of human society. 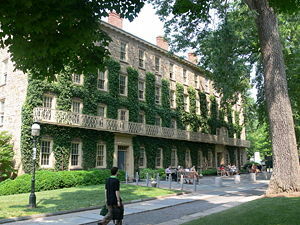 The Ivy League's name derives from the ivy plants, symbolic of their age, that cover many of these institutions' historic buildings. "Planting the ivy" was a customary class day ceremony at many colleges in the late 1800s. Ivy planting ceremonies are reported for Yale, Bryn Mawr, and many others. Princeton's "Ivy Club" was founded in 1879. The first usage of "Ivy" in reference to a group of colleges is from sportswriter Stanley Woodward (1895-1965): "A proportion of our eastern ivy colleges are meeting little fellows another Saturday before plunging into the strife and the turmoil." However, it has been noted that Stanley Woodward actually took the term from fellow New York Tribune sportswriter Caswell Adams. The first known instance of the term "Ivy League" appeared in the Christian Science Monitor on February 7, 1935. Several sports-writers and other journalists used the term shortly later to refer to the older colleges, those along the northeastern seaboard of the United States, chiefly the nine institutions with origins dating from the colonial era, together with the United States Military Academy (West Point), the United States Naval Academy, and a few others. These schools were known for their long-standing traditions in intercollegiate athletics, often being the first schools to participate in such activities. However, at this time, none of these institutions made efforts to form an athletic league. "Ivy League" became, like WASP, a way of referring to this elite, and elitist, class. The term Ivy League is now most commonly used to refer to eight universities who formed the "Ivy League" athletic conference. 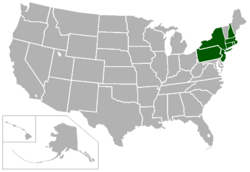 The eight member institutions are all located in the Northeast region of the United States and are privately owned and controlled. Undergraduate enrollments among the Ivy League schools range from about 4,000 to 14,000 (Dartmouth and Cornell respectively), making them larger than those of a typical private liberal arts college and smaller than a typical public state university. Ivy League university financial endowments are in the billions of dollars, ranging from Brown's over $2 billion to Harvard's over $30 billion, the largest financial endowment of any academic institution in the world. Cornell University Ithaca, New York Big Red 20,638 "I would found an institution where any person can find instruction in any study"
Seven of the Ivy League schools are older than the American Revolution; Cornell was founded just after the American Civil War. The seven provided the overwhelming majority of the higher education in the Northern and Middle Colonies; their early faculties and founding boards were largely, therefore, drawn from other Ivy League institutions; there were also some British graduates—more from the University of Cambridge than Oxford, but also from the University of Edinburgh and elsewhere. The founders of Rutgers University, in 1766, were largely Ivy; and so were many of the colleges formed after the Revolution. Cornell provided Stanford University with its first president and most of Stanford's initial faculty members were Cornell professors. The founders of UC Berkeley came from Yale. Note: Founding dates and religious affiliations are those stated by the institution itself. Many of them had complex histories in their early years and the stories of their origins are subject to interpretation. "Religious affiliation" refers to financial sponsorship, formal association with, and promotion by, a religious denomination. All of the schools in the Ivy League are private and not currently associated with any religion. Most of these seven original schools were Congregationalist or Presbyterian in religious denomination; Church of England King's College broke up in the Revolution, and was reformed as public non-sectarian Columbia College. In the early nineteenth century, the specific purpose of training Calvinist ministers was handed off to theological seminaries; but a denominational tone, compulsory chapel, and other such religious features often lasted well into the twentieth century. After the Second World War, the present Ivy League institutions slowly widened their selection of students. They had always had distinguished faculties; some of the first Americans with doctorates had taught for them; but they now decided that they could not both be world-class research institutions and be competitive in the highest ranks of American college sport; in addition, the schools experienced the scandals common among other big-time football programs, although more quietly. The Ivies have been competing in sports as long as intercollegiate sports have existed in the United States. Boat clubs from Harvard and Yale met in the first sporting event held between students of two U.S. colleges on Lake Winnipesaukee, New Hampshire, in 1852. As an informal football league, the Ivy League dates from 1900 when Yale took the conference championship with a 5-0 record. For many years, Army (the United States Military Academy) and Navy (the United States Naval Academy) were considered members, but dropped out shortly before formal organization. Before the actual establishment of the Ivy League, an informal agreement on certain matters relating to sports was enjoyed among the schools. Yet, despite such collaboration, the universities did not seem to consider the formation of the league as imminent. On December 3, 1936, the idea of "the formation of an Ivy League" gained enough traction among the undergraduate bodies of the universities that the Columbia Daily Spectator, The Cornell Daily Sun, The Dartmouth, The Harvard Crimson, The Daily Pennsylvanian, The Daily Princetonian, and the Yale Daily News simultaneously ran an editorial entitled "Now Is the Time," encouraging the seven universities to form the league in an effort to preserve the ideals of athletics. The proposal did not succeed—on January 11, 1937, the athletic authorities at the schools rejected the "possibility of a heptagonal league in football such as these institutions maintain in basketball, baseball, and track." However, they noted that the league "has such promising possibilities that it may not be dismissed and must be the subject of further consideration." In 1945 the presidents of the eight schools signed the first Ivy Group Agreement, which set academic, financial, and athletic standards for the football teams. The principles established reiterated those put forward in the Harvard-Yale-Princeton Presidents' Agreement of 1916. The Ivy Group Agreement established the core tenet that an applicant's ability to play on a team would not influence admissions decisions. In 1954, the date generally accepted as the birth of the Ivy League, the presidents extended the Ivy Group Agreement to all intercollegiate sports. Competition began with the 1956 season. The College of William and Mary, founded in 1693, and Rutgers University, founded as Queen's College in 1766, both public universities, are the only institutions among the nine colonial colleges not included. The governing body of the Ivy League is the Council of Ivy Group Presidents. During their meetings, the presidents often discuss common procedures and initiatives. Beyond the historic athletic conference, there are several cooperation programs among the schools. Seven of the eight schools (Harvard excluded) participate in the Borrow Direct interlibrary loan program, making a total of 88 million items available to participants. There is also the student-led Ivy Council that meets in the fall and spring of each year, with representatives from every Ivy League school. At these multi-day conferences, student representatives from each school meet to discuss issues facing their respective institutions. Ivy champions are recognized in 33 men's and women's sports. In some sports, Ivy teams actually compete as members of another league, the Ivy championship being decided by isolating the members' records in play against each other. (For example, the six league members who participate in ice hockey do so as members of ECAC Hockey; but an Ivy champion is extrapolated each year.) Unlike all other Division I basketball conferences, the Ivy League has no tournament for the league title; the school with the best conference record represents the conference in the Division I NCAA Basketball Tournament (with a playoff in the case of a tie). On average, each Ivy school has more than 35 varsity teams. All eight are in the top 20 for number of sports offered for both men and women among Division I schools. Princeton and Penn are longstanding men's basketball rivals and "Puck Fenn" and "Puck Frinceton" t-shirts are worn at games. In only six instances in 51 years (from the 1955-56 season through the 2006-07 season) has neither Penn nor Princeton won at least a share of the Ivy League title in basketball, with each champion or co-champion 25 times. Penn has won 21 outright, Princeton 18 outright. Princeton has been a co-champion seven times, sharing four of those titles with Penn (these four seasons represent the only times Penn has been co-champion). Rivalries exist between other Ivy league teams in other sports, including Cornell and Harvard in hockey (either team has won or shared the men's title each of the last five years,) and Harvard and Penn in football (Penn and Harvard have each had two unbeaten seasons since 2001.) Harvard and Yale are celebrated football and crew rivals. Although no longer as successful nationally as they once were in many of the more popular college sports, the Ivy League is still competitive in others. One such example is rowing. All of the Ivies have historically been among the top crews in the nation, and most continue to be so today. (Other historical top crews include California, Washington, Wisconsin, and Navy). On the men's side, Harvard won the Intercollegiate Rowing Association Championships in 2003, 2004, 2005, and on the women's side, Harvard and Brown won the 2003 and 2004 NCAA Rowing Championships, respectively. The Ivy League schools are also very competitive in both men's and women's hockey. In addition, no team other than Harvard or Princeton has won the men's swimming conference title since 1972, although Yale, Columbia, and Cornell have shared the title with Harvard and Princeton during this time. ↑ Boston Daily Globe, June 27, 1882, p. 4: "CLASS DAY: Yale Seniors Plant the Ivy, Sing "Blage," and Entertain the Beauty of New Haven;"
↑ The Gazette Times, Play a Romance and Plant Ivy, Pretty Class Day Exercises of the Women's College, June 9, 1907. Retrieved October 27, 2011. ↑ The Ivy Club, History. Retrieved October 27, 2011. ↑ 5.0 5.1 Fred R. Shapiro, Yale Book of Quotations (Yale University Press, 2006, ISBN 0300107986). ↑ William Morris, Morris Dictionary of Word and Phrase Origins (Collins, 1988, ISBN 006015862X). ↑ Joseph Epstein, Snobbery: The American Version (Houghton Mifflin, 2003, ISBN 0618340734). ↑ Alexander Leitch, A Princeton Companion (Princeton University Press, 1978, ISBN 0691046549). ↑ Brown University, Full-time Enrollment September 2007, About Brown University, 2007. Retrieved November 13, 2007. ↑ Columbia University, Full-time Enrollment Fall 2005, Columbia University Statistical Abstract, 2006. Retrieved November 13, 2007. ↑ Cornell University, Total Enrollment Fall 2006, Facts About Cornell, 2007. Retrieved November 13, 2007. ↑ Dartmouth College, Total Enrollment Fall 2006, Dartmouth College Fact Book: Enrollment, 2006. Retrieved November 13, 2007. ↑ President and Fellows of Harvard College, Total Enrollment Fall 2006, Harvard at a Glance, 2007. Retrieved November 13, 2007. ↑ Princeton University, Total Enrollment Fall 2006, Data and Information, 2006. Retrieved November 13, 2007. ↑ University of Pennsylvania, Total Enrollment Fall 2007, Facts and Figures, 2007. Retrieved November 13, 2007. ↑ Yale University, Total Enrollment Fall 2006, Factsheet, 2007. Retrieved November 13, 2007. ↑ Office Of Student Development, Student History, University of California Berkeley. Retrieved November 13, 2007. ↑ Orange Key Virtual Tour of Princeton University, University Chapel, 2007. Retrieved November 13, 2007. ↑ Net Industries, Providence, 2007. Retrieved November 13, 2007. ↑ James Axtell, The Making of Princeton University (Princeton University Press, 2006, ISBN 0691126860). ↑ The Associated Press, Colleges Searching for Check On Trend to Goal Post Riots, The New York Times 33, December 6, 1935. ↑ New York Times, Immediate Formation of Ivy League Advocated at Seven Eastern Colleges, 33, December 3, 1936. ↑ New York Times, Plea for an Ivy Football League Rejected by College Authorities, 26, January 12, 1937. ↑ Bernard M. Gwertzman, Ivy League: Formalizing the Fact, The Harvard Crimson, 1956. Retrieved November 24, 2007. ↑ Columbia University Libraries, Request It: Borrow Direct. Retrieved November 13, 2007. ↑ Ivy Council, Ivy Council Homepage, 2007. Retrieved November 13, 2007. ↑ Austin Starkweather, The game: The tables are turned—Penn hoops travel to Jadwin tonight for premier rivalry of Ivy League basketball, 2002. Retrieved November 13, 2007. ↑ Ramesh Nagarajan, The rivalry? Not with Penn's paltry performance this season. Retrieved November 13, 2007. ↑ Ivyleaguesports.com, Men's Ice Hockey, 2007. Retrieved November 13, 2007. ↑ Ivyleaguesports.com, Football, 2007. Retrieved November 13, 2007. Axtell, James. The Making of Princeton University. Princeton University Press, 2006. ISBN 0691126860. Barreca, Gina. Babes in Boyland: A Personal History of Co-Education in the Ivy League. UPNE, 2005. ISBN 1584652993. Bernstein, Mark F. Football: The Ivy League Origins of an American Obsession. U Penn Press, 2001. ISBN 0812236270. Epstein, Joseph. Snobbery: The American Version. Houghton Mifflin, 2003. ISBN 0618340734. Goldstein, Richard. Ivy League Autumns: An Illustrated History of College Football's Grand Old Rivalries. St. Martin's Press, 1996. ISBN 0312146299. Leitch, Alexander. A Princeton Companion. Princeton University Press, 1978. ISBN 0691046549. Rudolph, Frederick. American College and University: A History. University of Georgia Press, 1990. ISBN 0820312843. Shapiro, Fred R. Yale Book of Quotations. Yale University Press, 2006. ISBN 0300107986. Wolff, Robert Paul. The Ideal of the University. Transaction Publishers, 1992. ISBN 156000603X.